Definitely worth another look, this book from ten years ago still has a fresh approach to learning about where the food we eat comes from. 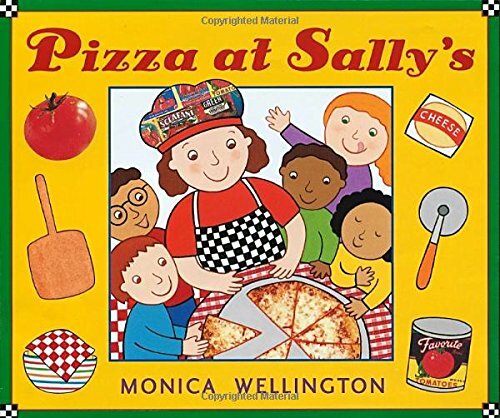 Sally grows tomatoes, destined for the pizza, in her garden. Wheat comes from the farm, helped along by the farmer and his equipment. Cheese, from the shop next door, is made from milk. When Sally opens her shop, she takes the orders and assembles the finished pizza for take-out and eating in. She begins by mixing and working the pizza dough. Sauce, cheese, and added ingredients follow. As an illustrator, Wellington includes all sorts of information, such as many of the things other than cheese that come from milk. This is a helpful, simple, and subtle message that promotes comprehension and literacy skills. Each step of the process is deftly shown, complete with many details. Through it all, Sally’s cat assists her. Kids can look for details such as the names of the ingredients, the names on the order pad (which partially match the book dedication), different vehicles, Italian words and their translations, etc. A fun book about a favorite food.